The Atlantikwall had several depths in the lines of defence. The first task for the coastal batteries, navy or army, was to engage the allied landingfleet at the largest possible distance. The coastal batteries were mostly equipped with former "navy" guns, so they can be seen as warships on land. Construction on steady land had big advantages: the guns did not roll on the waves and the firecontrol does not have to recalculate the movement of their own ship sailing along in a straight line of fire. They had also the possibilty to use pre-sited markings at sea, such as buoys, sandbanks and shipwrecks. We made a total view of these, once naval guns, re-used on the Atlantikwall and have added extra information on the origine of the guns in the pages sorted by caliber. The overviews per caliber are lined up from north to south. 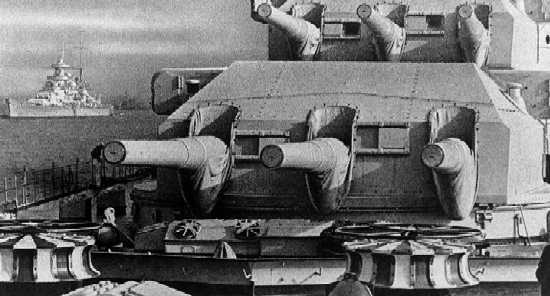 In this first series we bring you the guns above 20 cm, including the interesting 15 cm secondary guns of the "Gneisenau". The big railwayguns, other calibers and the re-used 10.5 cm U-boatguns, maybe will follow. The turrets "Anton" and "Bruno" of the "Gneisenau".